Rob is passionate about functional yoga and is committed to providing a safe, healing and fun experience, melding the traditional wisdom of the Indian gurus with the evolving knowledge of biomechanics. Rob sees yoga as a lifelong path of learning. This originally took him on three five-week trips to Pune, India, in 2003, 2005 and 2007, to study with the family of B.K.S. Iyengar. More recently his path of learning has moved his focus to the work of Katy Bowman, Todd Hargrove, Bernie Clark and Matthew Remski. 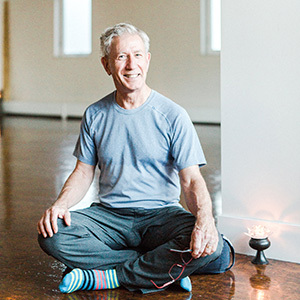 A yoga teacher for 20 years, Rob has a passionate and vigorous style, encouraging students to safely challenge their perceived limits… and to see yoga as more than asana. Rob has written for Yoga Journal, appeared weekly on Shaw Cable, twice on the City-TV Breakfast Show, and in the Calgary Herald and other publications. He is certified at the fourth level by the Iyengar Yoga Association of Canada. Rob currently owns and directs the Alberta Yoga College.